A tour full of speed, adrenaline and amazing landscapes. 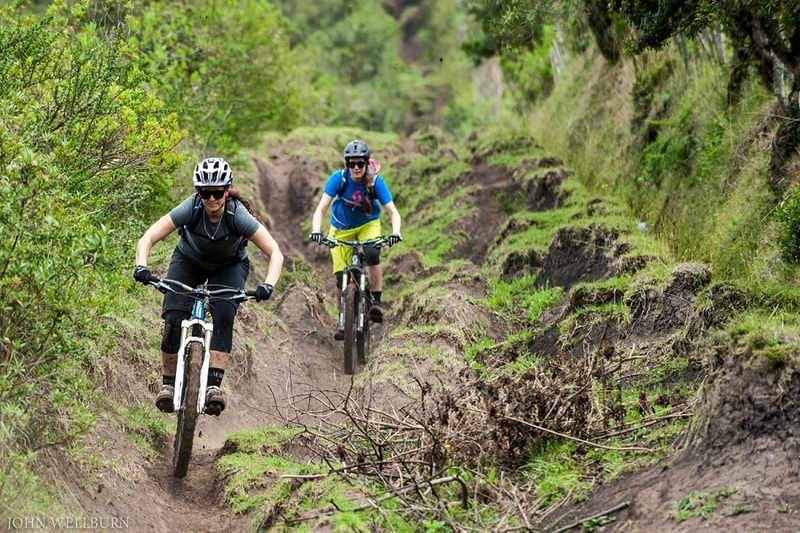 The exciting and challenging mountain biking trails take you through the Avenue of Volcanoes, the Cotopaxi National Park, the Quilotoa crater Lagoon, the Pululahua Volcano and Nono. You will alternate mountain biking with relaxation and cultural exploration. Our professional bilingual guides make sure you experience these amazing places in an exciting and safe way. The daily routes are between 20 and 50 km long and vary from an easy to a hard level, providing a nice variety. Welcome to Ecuador! After your arrival at the Mariscal Sucre International Airport and one of our drivers will pick you up and transfer you to the hotel. Afterwards you will be picked up for a visit to the Panecillo, an excellent viewpoint over the city and surrounding volcanoes. Then you can take part in an interesting bike tour through the historical center. 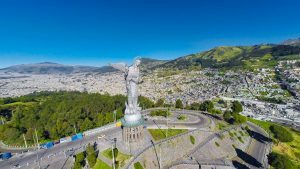 During this tour we will see the best know landmarks of Quito, such as the Gothic Cathedral Basilica, Plaza de la Independencia, the Archbishops Palace, the Iglesia de la Compañía and the Iglesia de San Francisco. We will finish the tour in a nice restaurant with spectacular views of the city. After breakfast we get a briefing on the cultural and geographical area from our local staff who will accompany us throughout our journey of Ecuador. Together we will check our maps, grease our chains, check our brakes, reset our clocks and set off on our challenge! The journey will start north of Quito close to the official and famous equatorial line statue where the French explorer named the country in their letters the equatorial land. We will start the ride on the edge of the crater on the Geobotanic reserve of Pululahua. 35 km of ride inside of the crater where we can enjoy the biodiversity of this reach lands. We will continue our ride, passing along rainforests, cliffs, waterfalls and refreshment stops where guides will provide explanations about animals and plants unique to the area. 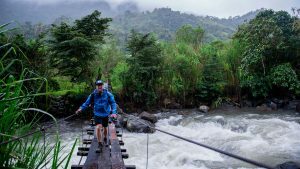 After riding forabout three hours and slowly descending into lower grounds, we will arrive to Mindo, a pastoral town located in the cloud forest (subtropical zone), at 1,800m. Here we connect to treetop harnesses and begin our canopying adventure of 13 cables over the treetops and hiking trail with spectacular views of the rainforest and waterfalls. We’ll take a cable car across the valley and into the challenging single track towards the waterfall. After a refreshing dip, we’ll continue to brave the rapids and the day finishes with a visit to the butterfly farm which is also home for the night. After spending the night at the magical butterfly farm with sounds of rushing water from the Mindo River we will enjoy a hearty breakfast and listen to our briefing about todays 13 zip-line circuit above the trees of the Mindo-Nambillo protected forest. After a nice picnic we start our bike ride in the vicinity of the Cloud Forest to Nono, from where your guide will take you to the colonial guesthouse ‘Hosteria Papagayo Cotopaxi’. Now, after an exhausting day you can relax in in the hot tub and enjoy the rest of the estate. After spending the night at the magical butterfly farm we will wake up to the sounds of the rushing river of Mindo. We’ll enjoy a good local style breakfast and there will be a briefing about the plans for the day. The drive starts on a dirt track that surrounds the region of Pichincha. 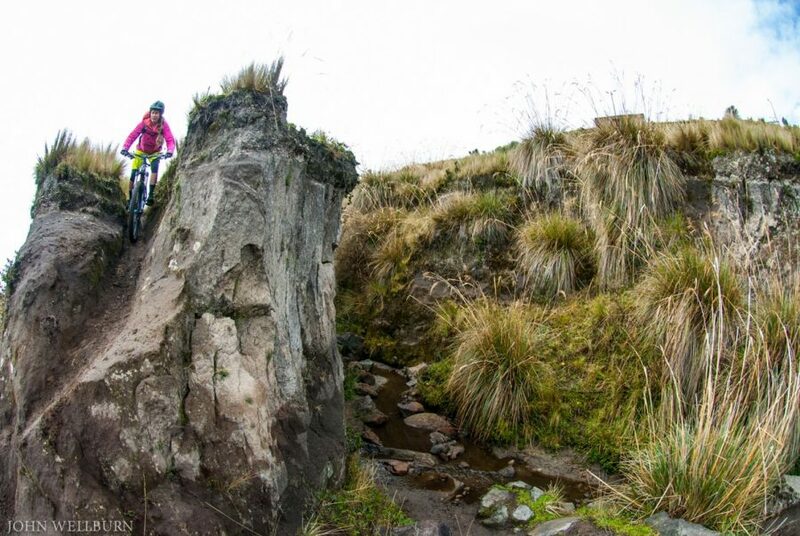 Today we will be biking to Pichincha Volcano with beautiful views overlooking the valley and the tropical region. We will reach the refuge of this amazing volcanoe and then go down until the town of Lloa, from here your guide will take you to the colonial guesthouse ‘Hosteria Papagayo’. After an exhausting day you can relax in in the hot tub and enjoy the rest of the estate facilities. From there we go on with the bus to the ‘Hosteria Papagayo Cotopaxi’, where the staff is waiting with a delicious lunch and a slice of cake. After breakfast, we will prepare the bikes and start to ride in the area of the Corazon and Illinizas volcano. We will travel through farms riding on dirt roads. Furthermore we will see locals working on their daily tasks like looking after the animals. If we are lucky we can observe the amazing Cotopaxi volcano. Today we will leave PapaGayo biking southwestwards of the Avenue of Volcanoes. 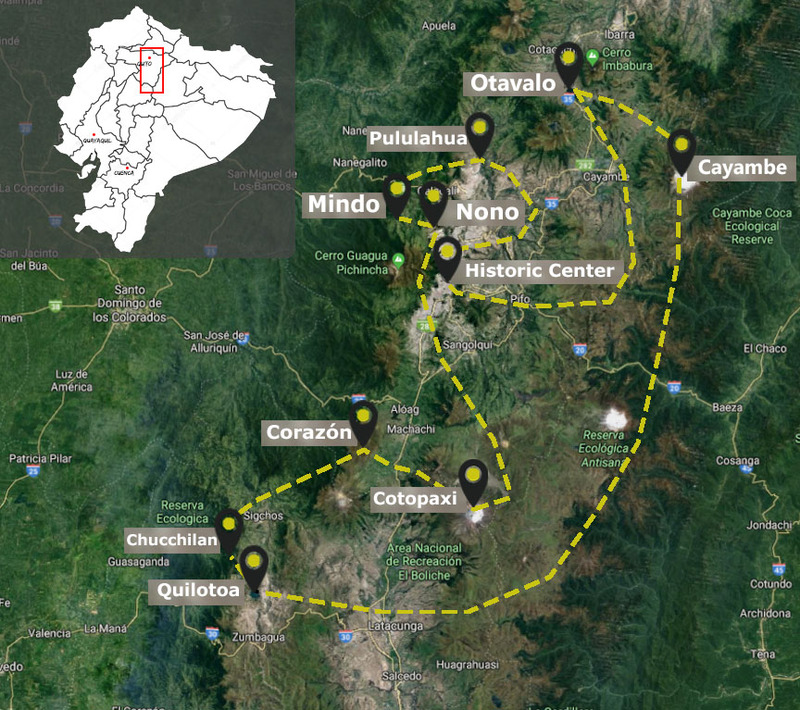 The ride will start off road where Simon bolivar and the general Sucre have leaded the revolution army into the region of Pichincha. 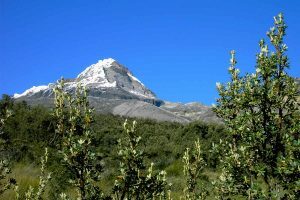 We will continue on a single trek and cross the river of Pucara. After 20 km we will get to the pass over the south ridge of the Ilinizas volcano. From there we will continue on a fast downhill trekn into the village of Pastocalle where we will have our lunch. We will continue driving for a couple of hours and spend the night in Chuqchilan. 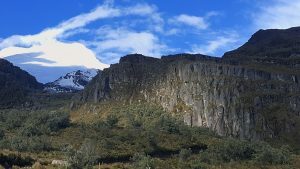 The drive to Quilotoa displays beautiful views of the Andean mountains passing the ancient canyon of Zumbahua and many indigenous towns and farmlands. 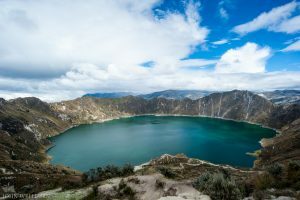 Quilotoa is a spectacular volcanic crater lake surrounded by mountains and green forest. We will cross pine forests and pass the famous trees Polylepis spending time of mountain biking in the area around the lagoon which offers spectacular views of the beautiful mountain scenery and villages. Before lunch we will descent to visit the Shalala community in Quilotoa. In the afternoon we will be transfered to Hosteria PapaGayo Cotopaxi where we will spend the night. 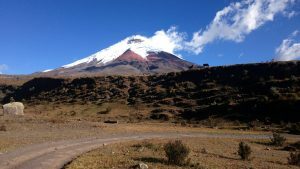 Having arrived at the Cayambe-Coca Ecological Reserve we will trek around for about 1-2 hours and strengthen ourselves with a nice lunch in a typical restaurant afterwards. Then we head by car to the hot springs of Papallacta where you can treat yourself with a relaxing bath in the hot waters or optional treatments like massages in the Spa before we return to Quito. 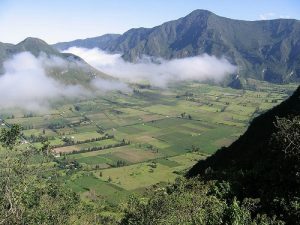 We will start our day with the ride to the Imbabura view point and visit the San Pablo Lagoon. Then we will make our way to Otavalo where we will talk about the history of the Craquito tribe. After a delicious lunch in a typical Ecuadorean restaurant we will visit the famous indigenous market. 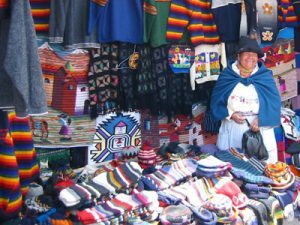 There you have the chance to buy some handicrafts before we return to Quito.